This image, shows Jupiter's volcanic moon Io passing above the turbulent clouds of the giant planet, on July 24, 1996. The conspicuous black spot on Jupiter is Io's shadow. 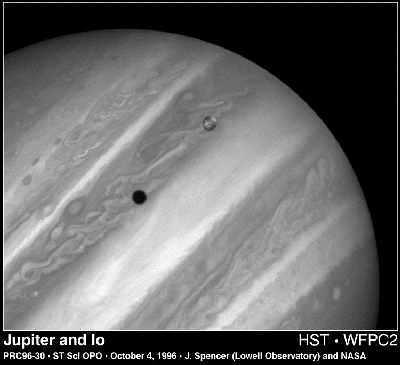 The shadow is about the size of Io (3,640 kilometers or 2,262 miles across) and sweeps across the face of Jupiter at 17 kilometers per second (38,000 miles per hour). The smallest details visible on Io and Jupiter are about 100 miles across. Bright patches visible on Io are regions of sulfur dioxide frost. Io is roughly the size of Earth's moon, but 2,000 times farther away. This is one of a series of images of Io taken by Hubble to complement the close-up images currently being taken by the Galileo spacecraft now orbiting Jupiter. Though the Galileo images show much finer detail, Hubble provides complementary information because it can observe Io at ultraviolet wavelengths not seen by Galileo, can observe Io at different times than Galileo, and can view Io under more consistent viewing conditions. The image was taken at violet wavelengths, with the Wide Field Planetary Camera 2, in PC mode.